What's SciFoo? Science Foo Camp, of course! (Here are links to Wikipedia and Twitter.) You've probably never heard of this 'unconference' - it's small, you need an invitation, and nobody talks about their data. It happens at the Googleplex (Google's headquarters in Mountain View California. About 200 people, mostly scientists but also journalists, artists and teachers, gathered for two days of high-quality conversations. Some of the conversations happen in specific blocks of time, and the rest over meals and drinks and demos and just hanging around. Much more like a series of wonderful dinner parties than like a typical scientific meeting. 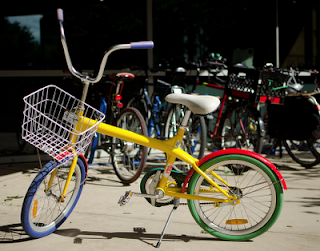 The bike is part of Google's fleet (photo from aemkei's Flickr photostream). I was going to take one for a spin, but they're 'fixies' (fixed-wheel, no brakes) and I didn't think my cycling skills were flexible enough to save me from crashing when I wanted to stop. Go ahead and ride them -- they're not fixies, and they have breaks. It's just the kind where you push the pedals backwards a little to activate the break. You probably had a bike like this when you were a little kid.